Homemaking wasn’t my mother’s strong suit. She couldn’t even fry a potato! Cooking was an afterthought following a double shift and her night job. When I was growing up she wasn’t able to pass cooking skills onto me either. So, my first years of marriage consisted of spaghetti, baked chicken, and grilled pork chops. I was doing well with these three meals. The Husband (who took Home Ec in school) and YouTube, taught me to cook. Grocery shopping was a matter of what sounded good at the time. I don’t even think I went to the store with a list in hand. We frequently ate out or made frozen pizza. As my family grew, our budget shrank making eating out less feasible, and food allergies made prepared foods too expensive to use regularly; it became my mission to learn to cook tasty and healthy meals for my large family, without killing myself. I marveled at the sheer amount of milk and butter we consumed per week (currently five gallons plus BTW)! We’re talking a tactical operation, or we all starve! 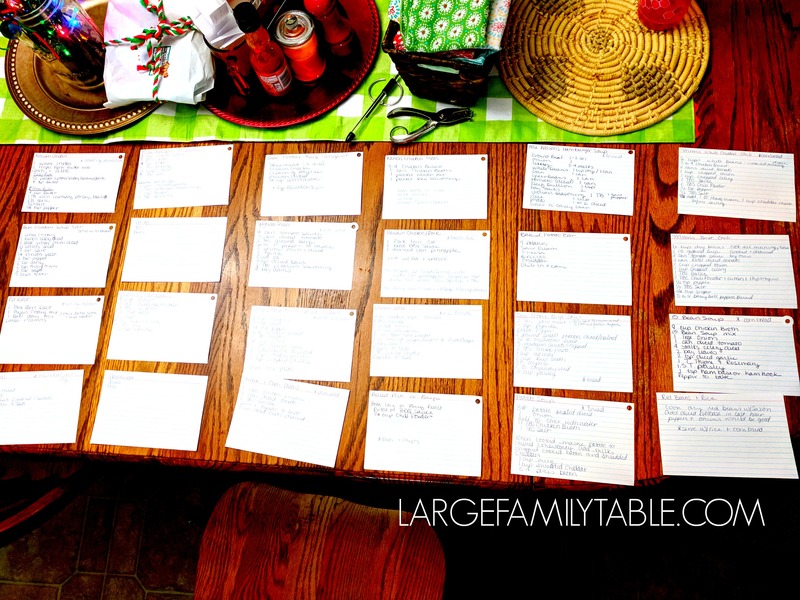 Before I simplified, the whole large family meal planning process could take me an entire day to accomplish. (Ain’t nobody got time for that!) I just didn’t know where to begin. Not to mention trying to coupon, cook from scratch, stay within our grocery envelope, and drag seven children to the store with me. The decision fatigue was killer! Meanwhile, everything else in our home was on hold while Mommy poured over cookbooks, websites and grocery ads just trying to feed us. Then it hit me, What if large family meal planning and large family grocery shopping could be on Autopilot? After 18 years of large family menu planning, swapping between weekly, biweekly, or monthly grocery shopping, I developed a large family meal planning system that makes dinner time as simple as those paid for menu subscription services! Here is Vicki’s homemade Large Family Meal Planning Menu Cards pictured above. Use 4×6 cards to record favorite recipes or meals. On one side write down your family’s favorite dinners such as Taco Night, Pizza, Breakfast for dinner or Spaghetti. Be sure to include all of your typical sides. If this seems like a daunting task just begin by writing down what you had for meals in the last week or two. It doesn’t have to be new, just what you know your family loves. You can expand your cards later. Keep it simple. 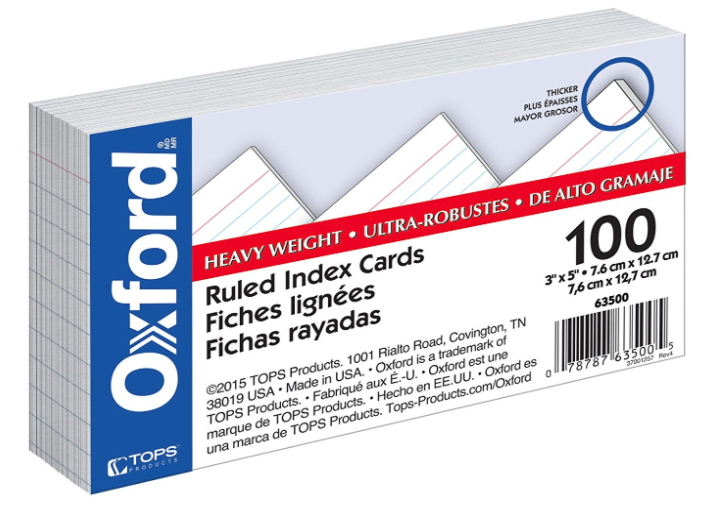 List the grocery items needed for those meals, including sides, on the back of each card. You can even include the ingredients list from your favorite recipes. Typically I don’t even need the instructions to these recipes, just the ingredients, and amounts. This becomes your large family menu plan! 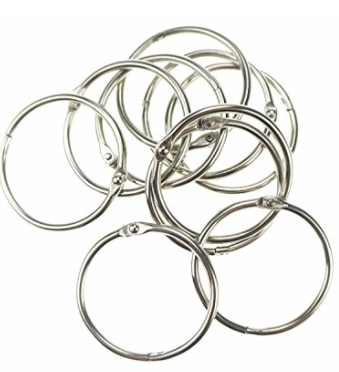 Punch holes in the corner and bind with a binder ring to keep them together. I hang mine on my fridge near my menu board for easy access. No more flipping through cookbooks for recipes because it’s all right there. 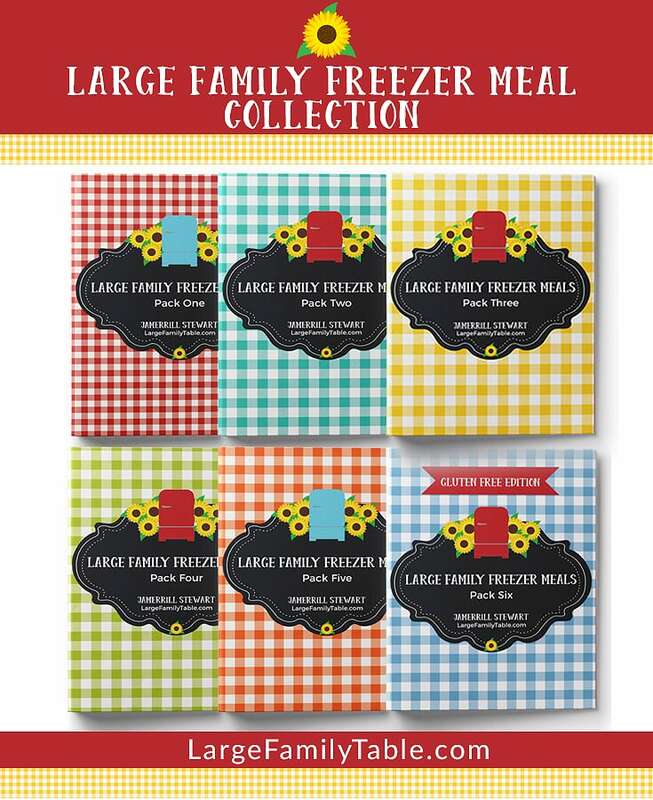 Create a pattern for your large family menu. Perhaps your pattern could be Roast, Soup, Italian, Mexican, Kid Night, Casserole, and Leftover night. (That is my favorite card, it just says “leftovers,” and I place it every 6 or so meals). After you have ten menus created, create a Large Family Master Grocery List from the ingredients you listed on the back of the cards. Organize your list by grocery section. All the dairy items together, all the baking good together. If you typically shop in different stores make two lists or color code your list. Be sure to include how much of something or the size you may need. Then just add what your staples are for other things like breakfast or lunch items, toiletries, laundry soap, etc. Leave some space at the bottom for extra grocery items that you may not be able to plan for like birthday presents or holiday items. Print your Master List and put it near your menu plan board. On grocery day just take your list and inventory your pantry. Highlight any item your running low on or are out of. 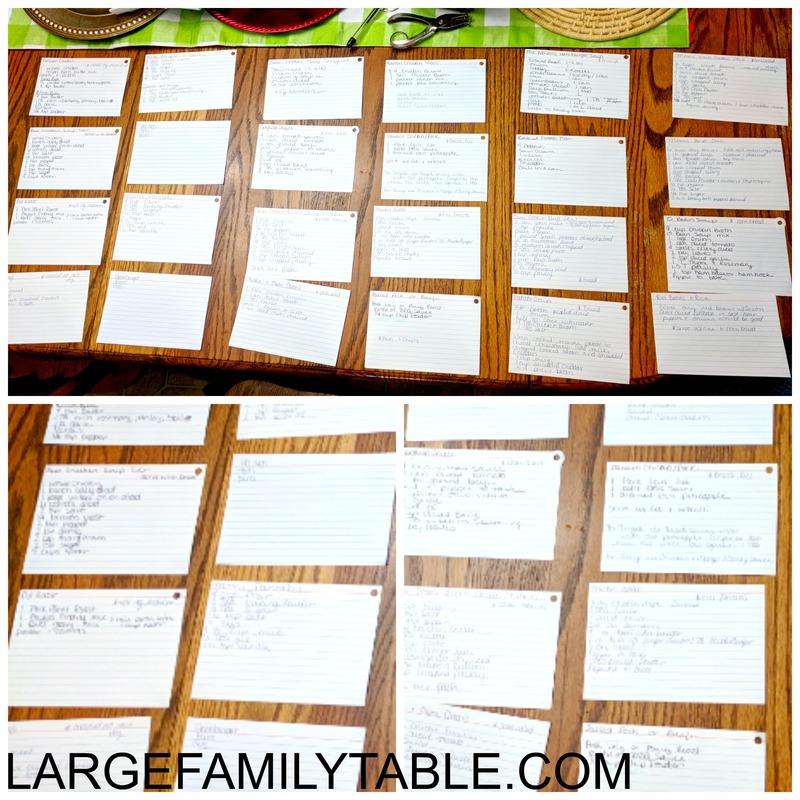 It took me about four weeks to perfect both my Large Family Meal Planning Menu Cards and my Large Family Master Grocery list. Since then, there has been peace in our home when it comes to dinner. Mom is not distracted (at least not with Menu Planning), the family knows what’s for dinner, toddlers have grown to love new foods, and our large family grocery budget is finally leveling out. No More “What’s for Dinner” Worries! In times of crisis, the last thing I had to worry about was “what’s for dinner.” We had had several times when I had minutes to prepare for a grocery run, and it was as simple as checking my pantry. I’ve also saved quite a lot stocking up when items are on sale because I knew precisely how much of an item I would use in a month. I’ve also been able to bless others because I knew I could throw a chicken noodle soup in the Instant Pot in minutes because I had a plan. With a well-laid plan, I can reduce decision fatigue and have more joy in preparing the Large Family Table. 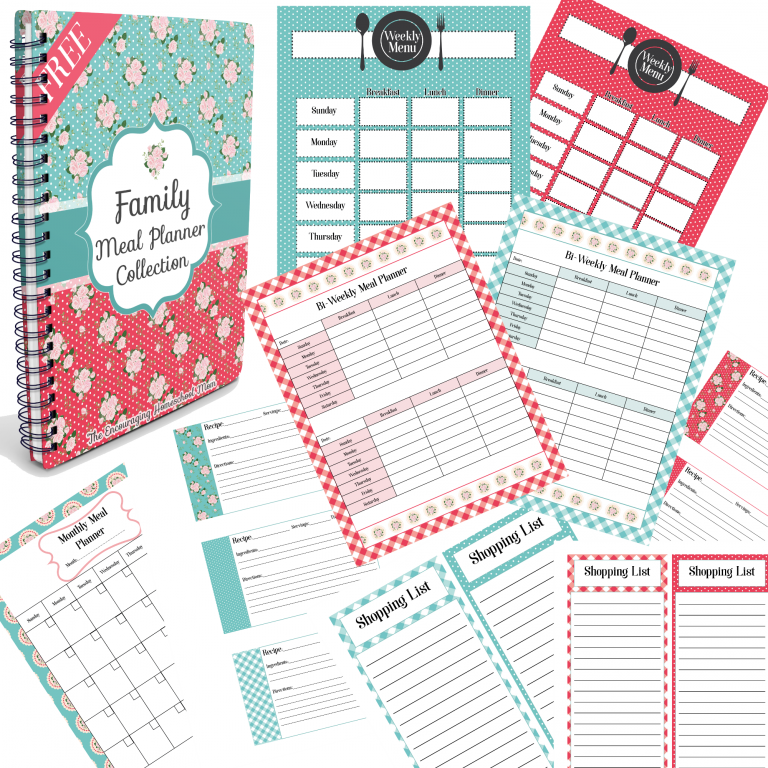 Jamerrill’s Family Meal Planner Collection additionally offers Weekly, Bi-Weekly, and Monthly meal planners and shopping lists if you’re interested! You can get if free here. 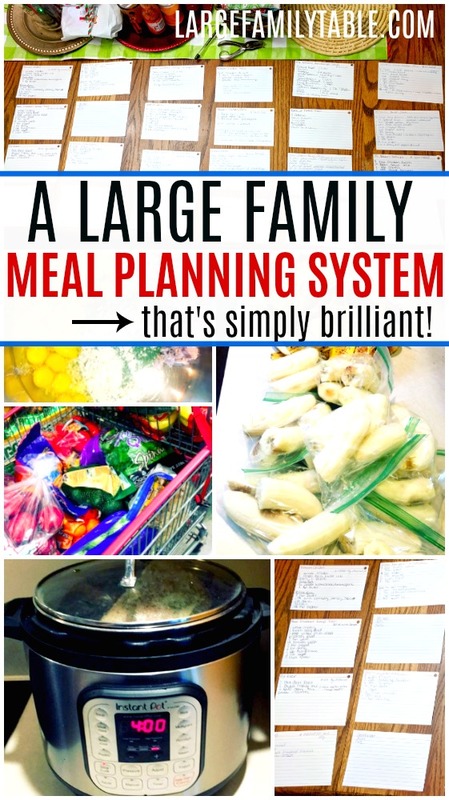 What is YOUR large family meal planning system? Share in the comments below! Would you like to write an article about your large family mom systems (share about your large family homeschooling, large family meal planning, organizing, grocery shopping, homemaking, and more!) to possibly be published on Large Family Table? If so, just email Jamerrill(at)LargeFamilyTable.com for consideration! Does Vicki Williams have a blog or instagram we can connect with? Cards to write meal ideas on & sort through as you have explained. Your way if making a gricery list off a few of the cards is what I love most here! Thank you! Great system! This could be the answer that I’ve been looking for! Thanks for sharing, Vicki!